AN important portrait by Sir John Lavery (1856-1941) and undoubtedly the most important early masterpiece by Louis le Brocquy (b. 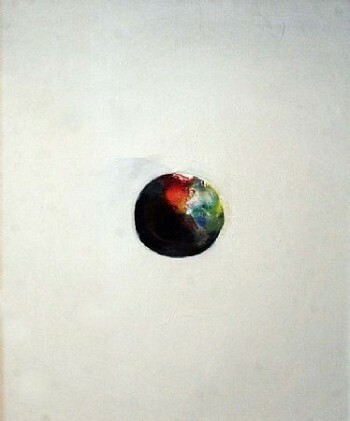 1916) will headline Sotheby’s annual Irish Sale in London on Thursday, 6 May 2010. Altogether there are 108 lots on offer. The Gold Turban by Sir John Lavery (lot 30) is considered one of the finest portraits by the artist of his wife Hazel (1880-1935). Painted in 1929, it is estimated at £400,000-600,000 (€441,000-665,000). The picture showcases the artist’s skilful handling of paint in the sitter’s headwear, luminescent skin and red lipstick. IN 1939, a group of works that belonged to the recently-deceased legendary art dealer Ambroise Vollard was deposited in a bank vault in Paris. Forgotten during the war and its aftermath, they remained in the vault for decades. They will finally make their first ever appearance on the market at Sotheby’s in June. more…. 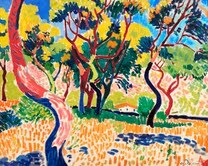 UPDATE: André Derain’s Arbres à Collioure sold to an anonymous telephone bidder for £16,281,250, (€19,521,241) having attracted strong bids from a number of potential buyers. This price establishes a new record for this artist as well as a record price for a Fauve painting at auction. 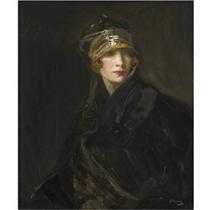 The top lot at the Morgan O’Driscoll sale in Cork on Monday was Sir John Lavery’s oil on canvas entitled Wilton. It made 10,250 against an estimate of 10,000-15,000. The sale of 285 lots was 69% sold and brought in a hammer price of 250,000. 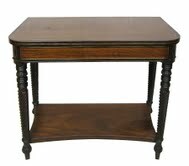 THERE is to be a large two day antiques fair in the leafy setting of the Fota Island Resort Hotel in Cork over the weekend of May 15/16. 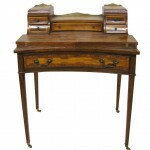 Dealers from around the country will be in attendance at the Munster Antique and Fine Art Fair. Organiser Robin O’Donnell of Hibernian Antique Fairs has been running regular fairs throughout Ireland for the past 20 years. Latterly he has upgraded a small number of these into two day events at venues like the K Club, the Culloden Hotel in Belfast and Dromoland Castle in Co. Clare with an emphasis on luxury. 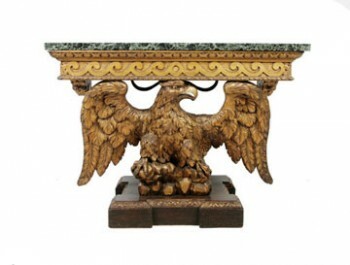 A pair of George III Jupiter giltwood eagle console tables made 70,890 inclusive of fees at the Sheppards Interiors and Exteriors sale in Durrow, Co. Laois on April 27. They had a pre sale guide price of 30,000-50,000. more..
A large oil by Arthur Maderson, Whilst the Band Played On, was the top lot at the Lynes and Lynes art auction in Cork on April 27. 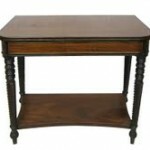 NEXT BLARNEY ANTIQUES FAIR SATURDAY AND SUNDAY THE 15TH AND 16TH MAY. Social historians will find much of interest in the Sheppards sale of over 1,000 lots at Durrow, Co. Laois on Tuesday April 27 at 10.30 a.m. Manuscript guest books from the original Burlington Hotel in Dublin and from the oft lamented Jammet’s Restaurant are on offer. The former covers the period from 1880 – 1899, the latter ranges from 1945-1967. Both are populated throughout by famous personalities including Charles Stuart Parnell, Maud Gonne, John E. Redmond, Laurel and Hardy, Bing Crosby and John Lennon. Lynes and Lynes will hold an art auction at MacCurtain St. in Cork on Tuesday, April 27 at 6.30 p.m. 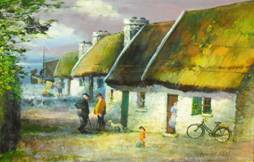 Among approximately 100 lots is an early collection of Sean O’ Connor oil paintings representing various Killarney landscapes. They were painted around 1950. He died in 1992. Estimates vary from 400 -700. 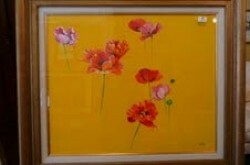 Kenneth Webb is represented with oils and watercolours. The top lot is Mystic Poppies, an oil on canvas estimated at 12,000 – 18,000. Other Webb paintings range in estimate from 2,800 -7,000. 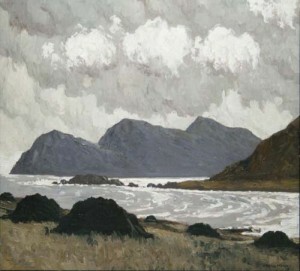 There are five works by Arthur Maderson and several Kerry and Galway scenes by Anne Marie Rossi Zen. There is an ink drawing by Pauline Bewick, two works by Elizabeth Brophy and several works by Declan O’Connor, Mark O’Neill and Martin Mooney. There are two works by the Cork based artist Maurice Desmond titled “Early Spring“ and “Early Spring II“ . These have estimates of 800 -1,500 each. Other artists included are Markey Robinson, Martin Finnin, Amanda Jackson, Dermod O’Brien, Patrick Cahill, Susan Webb, Bill Griffin, Hughie O Donoghue (a limited edition print) and Seamus Coleman. Viewing is on Saturday, April 24 from 11 a.m. to 8 p.m., on Sunday from noon to 8 p.m., from 10 a.m. to 8 p.m. on Monday April 26 and from 10 a.m. to the start of the sale on Tuesday, April 27. The letter written by Kevin Barry on the night before his execution which made a record 105,000 at the annual Adam's Mealy's Independence sale. Kevin Barry’s last letter, written the night before his execution in 1920, was the top lot at the Adams/Mealy’s annual Independence sale in Dublin. It made 105,000, seven times its estimate. 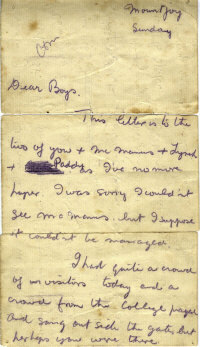 The buyer was the son of one of Mr. Barry’s friends, who was mentioned in the letter. The auction, which was 75 per cent sold, realised a hammer of 450,000 which becomes 550,000 after fees are added. A set of seven sculpted bronze heads of the signatories of the Proclamation by Rory Breslin made 26,000 while the cap badge reputedly worn by MIchael Collins when he was shot sold for 21,000, A letter announcing the discovery of the North West Passage made 16,000 while a file of War of Independence documents relating to the East Limerick Brigade of the Old IRA made 10,000. An original typescript document of the interrogation of Kevin Barry sold for 8,500, a set of husband and wife medals from the War of Independence awarded to Philip and Katherine Murphy of Enniscorthy made 8,000 and a collection of letters from 1916 Volunteer and Wakefield Prison and Frongoch internee James Mallon made 7,500. THE new owner of the letter has since given in on extended loan to the National Museum of Ireland and it is on view at Kildare St. This scorching Louis le Brocquy image entitled Orange is the top lot at the Morgan O'Driscoll sale in Cork on April 26. The top lot at the next Morgan O’Driscoll Irish art auction at the Radisson Hotel, Little Island, Cork on Monday, April 26 is a scorching Louis le Brocquy work entitled Orange. 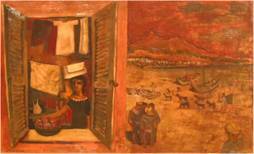 Painted in 1972 it bears the label Gimpel Fils Gallery on the back and is estimated at 50,000-70,000 euro. Many of the works on offer are far more affordable with estimates from about 300 euro up. The sale of 285 lots offers something for every collector at all price ranges. This is a buyer’s market and there is plenty of evidence to suggest that more and more buyers are waking up to this fact. This is a sale with much of interest from William Harrington’s charcoal and wash drawing Chatting from 1973 (600-900) to a wooden sculpture of the Virgin Mary by Markey Robinson estimated at 400-600 and a limited edition colour print by Picasso entitled Au Bain estimated at 1,500-2,000. Among the major works on offer are Going to Mass by Daniel O’Neill which is estimated at 20,000-30,000, Morning South by John Shinnors (20,000-30,000), Wilton by Sir John Lavery (10,000-15,000), Dunmanus Bay by Letitia M Hamilton (10,000-15,000), Rock Pool, Connemara by Kenneth Webb (12,000-18,000), Parkland by Basil Blackshaw (12,000-15,000) and Golden Frog by Pauline Bewick (10,000-15,000). Many lots have no reserves and Morgan O’Driscoll remarked that there is value that has not seen for the last 10 years. 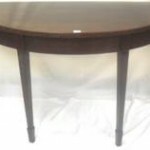 Viewing is from noon to 10 p.m. on Sunday April 25 and from 10 a.m. to the start of the sale at 6.30 p.m on Monday, April 26. 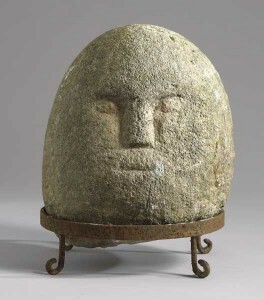 This Iron Age carved stone head found near Claudy in Co. Derry in the 1930’s was the top lot at the Whyte’s History Literature and Collectibles Auction which took place on April 23 . It made 26,000. The 523 lot sale featured historical artefacts, manuscripts, printed documents, posters, pamphlets, ephemera, medals, militaria, coins, banknotes, stamps and sports programmes. An archive relating to the Cork Distilleries including nine bottles of samples of Irish whiskey made from the 1930’s to the 1950’s sold for 1,450. A posthumous 1916 Rising medal issued to Volunteer John Owens made 15,000 and a rare edition of the 1937 Constitution signed by all the members of Eamon de Valera’s cabinet made 6,200. A collection of programmes for Irish Rugby 1922-82 made 4,000 and a pair of 1966 Padraig Pearse and 1916 Rising commemorative gold medals designed by Paul Vincze for Worboys, Dublin made 5,000. THE top lot at the de Veres sales in Dublin on April 13 was Paul Henry’s Achill Head from Keel. It made 60,000 in a sale where about 70 per cent of the 181 lots found buyers. 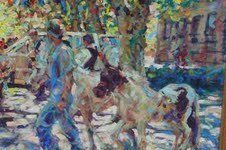 Tommy Orr the Blacksmith, an oil on canvas by Basil Blackshaw, made 40,000 and Ballywillan Church by Colin Middleton made 32,000. A five piece oil on canvas by John Shinnors, entitled English Alottment, Winter made 29,000 and Paul Henry’s Western Landscape made 26,000. The sale brought in over 500,000. In a comment afterwards auctioneer John de Vere White said that there are buyers out there, but they want value. Vendors must be realistic about this. The 5th Adam’s and Mealy’s annual auction of documents and memorabilia relating to the Irish struggle for freedom will take place over two sessions, at 11 a.m. and 5 p.m., in Dublin on Tuesday April 20. The sale includes almost 600 lots of newspapers, photographs, postcards, books, posters, medals, prison craftwork, letters and documents. This year’s auction features a number of documents of particular poignancy, including a letter handwritten by Kevin Barry the night before his execution in 1920. It carries an estimate of €14,000-18,000. Barry’s interrogation statement is estimated at €5,000-7,000. There is a copy of Aubrey de Vere’s Inisfail, inscribed by Roger Casement the night before his execution in 1916 (€5,000-7,000), and a copy of The Manual of Catholic Piety inscribed by Thomas Whelan and Patrick Moran on the eve of their execution in 1921. A number of items relate to the burning of Cork City in 1920, including original artefacts used by the Cork Fire Brigade (a stand pipe and a branch pipe), the 1921 “Who Burnt Cork City?” pamphlet, a Labour Commission report on the burning, and four postcards showing the devastation following the burning. Archives feature strongly. There are Fianna Fail documents and memorabilia amassed by Peter P. Moody in the 1930s and ‘40s, and an archive of material from Kathleen McKenna who was secretary to Michael Collins and Arthur Griffith, includes a cap badge reputed to have been worn by Michael Collins on the day of his death. A number of significant items of broader historical value include the announcement of the discovery of The North West Passage in 1850. Written by Wexford born Robert McClure the letters sent news of his discovery of The North West Passage and how the ship The Investigator was stuck in ice for nearly two years until the crew was rescued by HMS Resolute. There is a collection of 19th century photographs recently found at Rahinston, Co. Meath. They depict the Boyne Obelisk with the old and new bridge, high crosses, Slane Castle, the Houses of Parliament at College Green and other landmarks. Viewing is on Saturday and Sunday April 17-18 from 2 p.m. to 5 p.m. on each day and on Monday April 19 from 9.30 a.m. to 5 p.m. 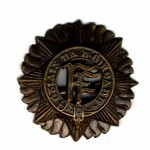 THIS Cap Badge, reputedly worn by Michael Collins on the day he was shot dead, features at the Adams Mealys Independence sale. 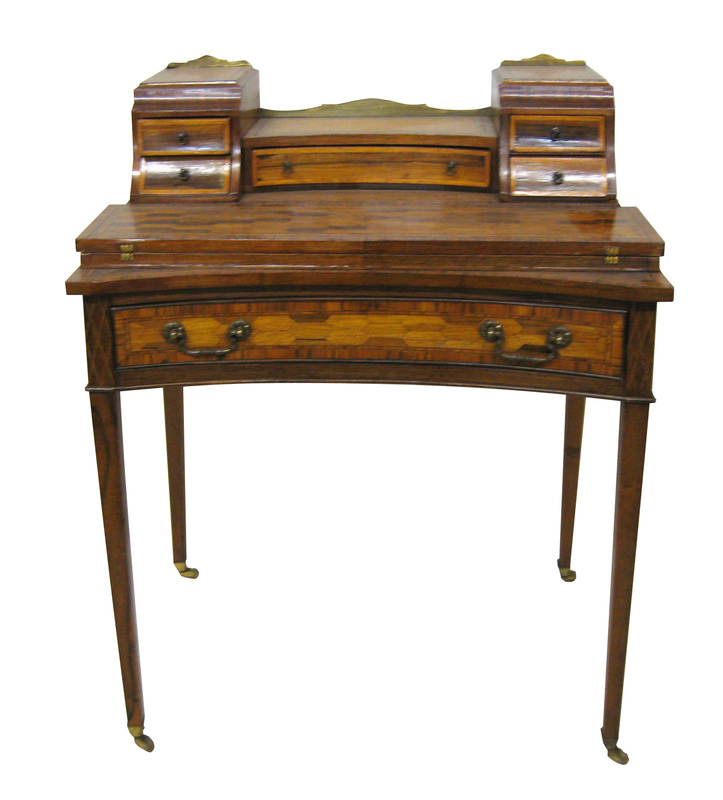 drawers and an Edwardian bonheur du jour. 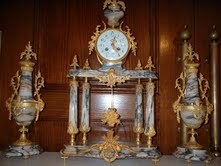 WOODWARDS had a successful sale in Cork on Wednesday. 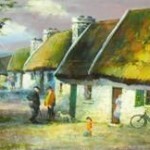 The top lot was an oil by Kenneth Webb, A Bit of Craic – Claddagh, Galway, which made 7,250. 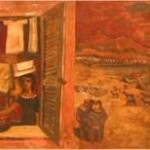 Looking at Figures on the beach by Gerard Dillon sold for 4.400. 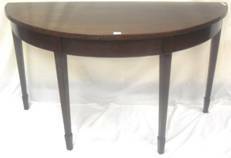 A rosewood and walnut games table made 2,100 and a Regency card table sold for 700.